You are at:Home»Lifestyle»The best travel bag for your next trip to France! Have you ever been standing in line at airport security trying to find everything at once and fumbling for your liquids’ bag, laptop and papers? Or flying with one of those pesky airlines which is strictly one carry on travel bag which means you have to open up your pull along bag and put everything in before boarding? You poke your laptop in the front and it falls over? Well that has definitely been me – lots of times! Then after a long journey where the flight is late AGAIN … I’d be running along with my little suitcase rolling behind me on its little wheels, trying not to bump everyone and desperately trying to make train connections! You get the idea – it’s the less glamorous side of travelling – the side we don’t write about on our blog as it doesn’t make a pretty picture! 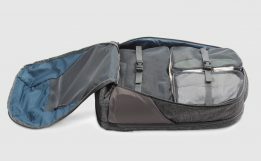 Well now we’ve found a travel bag solution that will make us look like the cool bloggers we really are when travelling! Some of the links below are affiliate links, meaning that at no additional cost to you we will earn a small commission if you click through and make a purchase. All opinions are our own. Will and Felix the founders of the brand Arcido made it their mission to make travel smarter and as easy as possible. They’ve developed a collection of travel bags that they themselves use to travel round the world. After Arcido contacted us and offered to send a travel bag for French Moments to review we were instantly impressed when we unpacked it. The good news is that they are offering French Moments’ readers a special discount and they are also giving away an Akra travel bag for one lucky reader. The giveaway is running in January and details about how to enter and also the special discount code if you want to buy one can both be found at the bottom of this page. We don’t do many product reviews on our blog as it’s important that we genuinely believe in what we promote. This travel bag honestly ticks all the boxes. 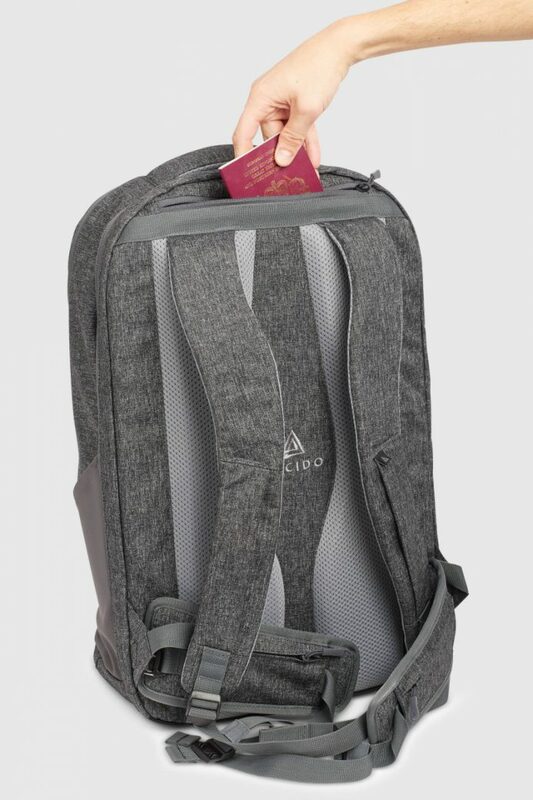 If you travel often or need to take gym gear and change of clothes to the office with your laptop and tech stuff each day then this travel bag is definitely one worth considering. I don’t know about you but I am over travelling with multiple bags and travelling with too much. Embracing a more minimalistic way of travelling is definitely on my list of goals for this year. 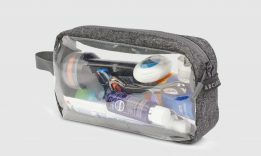 A one travel bag solution is something that makes travelling so much easier. Reducing the items you need to take so you can enjoy the travel experience more makes so much sense. I often travel with Aimée, my 5 year old and to have my hands free at airports to hold onto her and have papers in the other ready to board makes life so much better and safer. This bag is super comfortable so makes carrying everything on your back really do-able. The Akra travel bag is designed to have adequate space for clothes, shoes and tech. 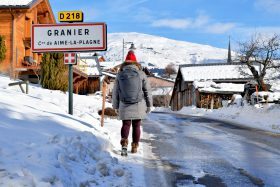 I tried out the bag in the French Alps and we took a few photos to show you what it looks like. We are really impressed by it and now Pierre and I both want one! We’ll be fighting over who’s taking it on the next blog trip! 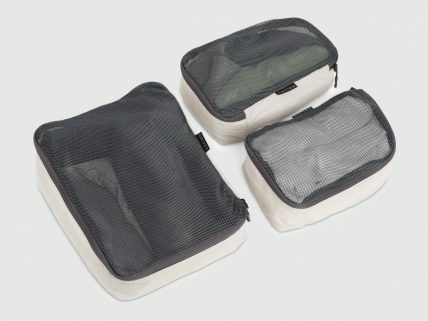 packing cubes, washbag (that is compliant with airline security) and shoe bag that can be inserted into the bag to make packing a breeze. These extras are available on their own or in a bundle to get better value. The Vaga day-pack is the little brother of the Akra and fits neatly in the middle of it’s older sibling. Transfer the laptop harness into it and voilà – you have a smaller version for days out when you just need some everyday items with you. 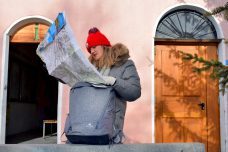 Arcido are giving away one of their Akra travel bags (worth £149) to one lucky French Moments’ reader! Comment on the blog post below with your favourite place to travel in France. Giveaway closes on 1st February 2019 at 10am GMT we will randomly draw a winner. We use Fluky to draw the winner. You must live in either Europe, US or Canada. When you comment you must leave your email address which we will use to contact you. The winner will be notified by email on the 1st February and we’ll publish your name on the blog. The winner will need to respond with their mailing address and a contact number. If we don’t hear back by the 10th February 2019 we will draw another winner. French Moments will give your name, email and mailing address to Arcido who will send you the Akra bag directly. The bag does not include extra accessories but feel free to order these using the discount code above if you want to buy these. We’ve just drawn the winner of the ARCIDO Akra travel bag giveaway using Fluky.io to make sure it’s random and the winner of the Akra bag giveaway is…. (drumroll please…!) TOM O’LAUGHLIN! Huge congratulations and we’ll send you a personal email in a moment to get your delivery address so Arcido can send this to you. Arcido is still offering a generous 15% off across their product range to French Moments’ readers using the code FRENCHMOMENTS until 31 May 2019 for anyone interested. Thank you for all your wonderful favourite holiday destinations – maybe we’ll feature some of the popular ones in future articles! Special discount on Arcido travel bags for our readers! Previous ArticleThis is Léon, the last Gas streetlamp in Paris ! Next Article What it’s like to ride the La Plagne Bobsleigh? My favourite place in France is Avignon. My wife and I visited there in 2018. Small enough for easy walking, huge history, magnificent buildings, nice restaurants and friendly locals. What more could you ask? We stayed at Aux Augustins, a lovely converted small monestery, which was a few minutes walk from the town centre. Hosted by the excellent Patrick we had a memorable holiday and would readily return, if not for living in Australia. Looking forward to a trip to Pris this July and taking the train with friends to Antwero, Belgium, where they live. friends joining us in Paris. It has to be Vimoutiers, twinned with the town in England where I grew up. It has a statue in front of the Mairie of Marie Herel, who apparently invented Camembert! My favorite place to visit in France? Paris. Nine visits, I think, and counting. More scheduled for 2019. There is no city in the world like it, and after visiting many of the top tourist spots there, all I need is just to “be” in Paris. It’s also a short train ride to Giverny, also a favorite! But truly, we continue to explore France and find lots of new “favorite “ places: Avignon, Annecy, this year will be Brittany…and more. My favourite place (How to choose but here goes…) – St Cyprien in Dordogne. This is the perfect little village to make your base for a visit to Dordogne for a week, a month or much more. It’s still a real village with real village life, including one of the best farmers’ markets every Saturday morning, a fabulous bakery, a well stocked seafood shop, even a supermarket too so you really don’t have to leave town. But of course, being in the middle of the fabulous Dordgogne region, with countless places to visit, castles popping up behind every hill, and ancient caves a short drive away, you do want to leave town at least some of the time. The locals are friendly and quaint, including a lady up near the cathedral who runs an association for those who simply like to do nothing… happy to sit and talk all day. Paris. If I received a job offer I would move there in a heartbeat. I’ve only visited Paris and Marseille so far in France. Of the two I preferred Paris but there are so many other places I want to discover there. I love reading your newsletter. Last year we visited France staying in Versailles. Absolutely loved the city of Versailles. We went to Paris for one day and enjoyed it very much. This year we are going back, staying in Versailles again. We will be spending 2 to 3 days visiting Paris. It is so easy to jump on the train from Versailles. I look forward to this blog every week. Great information for traveling to France. Thank You! I’m making my first trip to France in March! Spending 6 days in Paris and then to Strasbourg. I’ve enjoyed reading your newsletter! We had a great time in Juan les Pins last year. Ah, are you sure this is a fair question? A favorite place in France is like deciding which of your children you love more! I was there in June and of course I adore Paris but had some great experiences in other places, Reims, Rouen, Omaha Beach, Nantes, and wonderful, exciting Puy de Fou! How could I choose? After several trips to Paris, I am still looking for more in Paris. But there is so much more to discover in the Hexagon. Perhaps my favorite will change…. LaRochelle is one of the loveliest and liveliest cities on the Atlantic coast. With a rich history it it also an access point for visiting some of the most interesting areas of France. I loved the small villages in Alsace! Just visited Colman & Kayersburg to see the Xmas markets. Fabulous! Loved the wines too! Thanks for your review in the region! Mon coin préféré de France ? Le luberon ! Des villages pittoresques, abbayes somptueuses, champs de lavande magnifiques.. la quiétude et la fraîcheur de la Sorgues comme à Lisle sur la sorgue, les plans d’eau, la vigne… sans oublier the place to be : Gordes.. Spent an amazing, magical day in Aix en Provence when traveling through France. The natural beauty, the peacefulness and the people I met there has to put it on the top of my list! Such a fabulous variety of places to choose from! Rouen, St. Paul de Vence, Payzac, Mont.St.Michel….I think my next trip will be Paris and then Annecy. Vive La France! My favorite place to visit in France is Paris! There are always new things to see and new interesting local tours there. From Paris it is easy to visit anywhere else you want to go in France by train such as Provence / Normandy/ wine tour areas / and many more sites. I love traveling to Alsace and spending time in all of the lovely villages along the Route des Vins! My favourite place in France is Metz, even in the pouring rain which is what it did for several days during our stay. Lovely small city, friendly locals, great food, beautiful architecture. Definitely going back! I absolutely love the diversity of the Latin Quarter in Paris. After reading your blog post from October, cycling around Lake Annecy would be my favourite (fantasy) trip to France. My husband is an avid cyclist and would love tackling the steeper climbs nearby, but the Lake Annecy route tou described would be doable for both of us, I think! Paris bien sur! I made a few trips and plan to return every other year. Lucky for me I have traveled with first timers every time. This makes the trip feel brand new to me as well. But my next trip will be with someone who has been many times. Cant wait. My favorite area is the le parc at Rodin Musée. Très relaxant! I love all of France SO much,… but because I first stepped on French soil and was married in Paris, I must say Paris is my favorite city. Its history , art, people, museums, music , statues, Metro, windows, cats and dogs, flowers, gardens, cafes, stores, roofs, cathedrals…I just love it all!!!! I get homesick for it so often, though I’ve only been there three times…I would live there in a heartbeat if I possibly could…Anyone want to adopt an old Granny? We spent a few days in Saint Malo this summer, and immediately felt an affinity for the place: it felt like it could be home, and we definitely want to go back and spend more time there! My favourite place is Camargue. I’ ve enjoyed spending there one week and i would like to go back this summer! We are fortunate to live in France, which allows me to enjoy frequent trips to explore this beautiful country. My favorite region is the Massif Central. Highlights are Puy de Dôme, Aubusson, the Tarn gorges, Salers, Besse and the Château de Murol. Although we have made several trips to the Massif Central, there is still so much to discover. My favorite place in France is Paris. I’ve been here few times and I’ll visit it this spring. The nicest historic building for me is Musée de Cluny and the best view is the southern facade of Cathedral Notre Dame. The “Gorges du Verdon” are our pride!! I traveled to Carcassonne in 2017 and loved staying inside the walled city–no cars allowed! Wonderful places to eat and lots of sights, from the castle to the old graveyard just outside the walls. WE really enjoyed our time in France & were almost overwhelmed by all there was to see & do. I think my favourite place was the Alsace, Loraine region. It was beautiful, quaint & a wonderful surprise. I love to travel in the south of France, especially the historical city of Avignon. My favorite place in France is yet to come. We are planning our first trip to the south of France this June with side excursions to Lyon (a Mark Knopfler concert) and 5 days in Paris. Trip priorities include sampling food and wine in Provence, kayaking the Verdon Gorge and enjoying art everywhere. Thanks for all the helpful hints above but the one thing that is certain is that 5 weeks will be too short. Pour moi, ma destination préférée en France est Nancy-Metz en Lorraine. I love all of France but my favorite has to be the west coast, La Rochelle, where I attended CUFLE. It’s a close thing between Biarritz and St Jean de Luz. Both have the Atlantic pounding the shore and are studded with wonderful places to eat. Biarritz has the glamour of the Belle Epoque vying with the vibe of today’s surfers. St Jean, just that bit closer to the Spanish border, seems somehow more decidedly Basque, and it’s the Basque culture that I find so entrancing. And the food! France, France, France …. where to start? This marvelous country is not just a plot of land with many pieces, it is a feeling, many wonderful feelings. We have been to Paris many times, also to Beaune, Bayeux, Mont St Michel, Avignon, L’Isle-sur-la-Sorgue, Nice, Versailles, Gordes, too many memories. We hope to see Bordeaux, in May, for a wedding and more memories. We are celebrating our 50th wedding anniversary with a trip to France this April. It is a destination my wife has dreamed about since we were first married. We begin our trip in Toulouse and work or way to Paris for a five night visit. We are eagerly awaiting our new adventure. Love your newsletter with all your helpful tips. I cannot disagree with any of the comments above, everywhere I have been in France is wonderful. However, my husband and I hiked the Tour du Mont Blanc last summer and I fell in love with Chamonix. So, for now I think my favorite is the Alps regions and Chamonix. But, I am on my way back to Paris in just over a month, so we will see if the City of Light takes over as number one again. Ah l’Ardèche bien sûr ! Sainte eulalie. Mais chut ! C’est un coin secret….